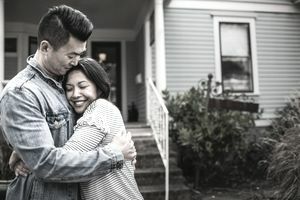 This form of ownership is sometimes referred to as "JTWROS"
If you're about to buy property with someone else, you'll encounter a lot of confusing terms relating to how you'll hold title. These terms convey some serious legal implications so it pays to know what you're getting into before you sign on the dotted line of that deed. One of these terms is "JTWROS." JWTROS stands for "joint tenancy with rights of survivorship." Let's start with the "joint tenants" part. Joint tenants are two or more people who own property together. Four requirements or "unities" must be present to allow them to hold title this way. Unity of time: They must take possession of the property concurrently, at the same time. Unity of title: They must take title by the same "instrument." An instrument is any document that legally transfers property, such as a deed or a will. Unity of interest: Each tenant or owner has an equal interest in the property. For example, three tenants would each have a one-third ownership share. This is the case even if one of them paid for the entire property—he would not be given an additional ownership stake. Unity of possession: Each tenant has a right to possess and enjoy the entire property even though he does not have a 100 percent ownership interest. Joint tenants can sell or transfer their shares to third parties without the approval or consent of the others. If Tenant A transfers or sells his interest to "Joe," the joint tenancy that was in place between Tenants B and C would remain in place—these two individuals would still be joint tenants with rights of survivorship. But because of the unity of time and unity of title requirements, Joe would not become a joint tenant with them. He did not take title at the same time or with the same instrument. Joe would, therefore, become a tenant-in-common with Tenants B and C.
The survivorship provision of a JTWROS allows the owners to automatically and immediately inherit another owner's share if one of them should die. The property would pass outside probate and by operation of law. This means that a tenant cannot transfer his share to beneficiaries in his will, and his heirs cannot inherit it if he dies without a last will and testament. His share automatically belongs to his co-tenants at his death. If Tenant A dies, Tenants B and C would now each hold a 50-percent interest in the property rather than a one-third interest. Because the transfer does not require probate, Tenant A's creditors would have no entitlement to his share and it would not be included in his estate to pay his final bills. This type of ownership can also be used with bank and investment accounts, as well as stocks, bonds, and business interests. It's not usually the default form of ownership when an asset is held by two or more people. They would typically hold title as tenants in common unless they specifically request this legal arrangement. Married tenants default to tenants by the entirety in most states.